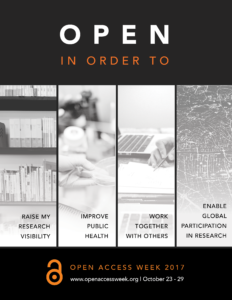 This week, October 23rd-29th, marks the 8th International Open Access Week, a week dedicated to learning about open access and sharing what we already know. Open access to information means the ability to get immediate access to research, data, and other resources without licensing and cost restrictions. Why? Open access to research can increase its exposure and impact. Open access means the public at large can access the latest research findings and data. Open access educational resources allow students to save money on textbooks and other course materials. They also allow instructors to customize textbooks and other course-related material for their courses. This week around the library building, on our website, and via our social media channels you’ll see open access highlights from the Library and around campus. See our Open Access & Public Access web page for more information about open access at Portland State University Library.